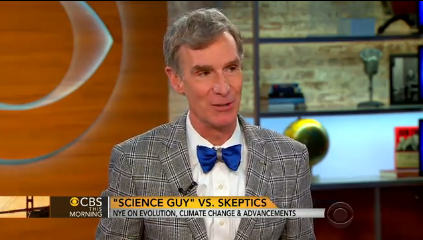 Bill Nye, the American science educator who is equally known by his nickname "The Science Guy", recently appeared on the television show CBS This Morning to talk about and promote his just-released book Undeniable: Evolution and the Science of Creation, a book inspired by his controversial debate with creationist Ken Ham last February at the Creation Museum in Kentucky. In the show, Nye reiterated his position that the future of the world will be much brighter if the young people of today are constantly educated about the trappings of science. He also stated that the downside to debating creationists like Ken Ham is that it somehow "energizes their base". When one of the show's hosts asked Nye's thoughts on Pope Francis' recent proclamations that the concepts of evolution and the big bang theory are real, Nye answered that these are "helpful". The Catholic Church's acceptance of the evolutionary theory is not new. Christian apologists who embrace the scientific theory often refer to it as "theistic evolution". Nye was also asked to reveal what his favorite scientific fact is. Nye's answer: "My favorite scientific fact is that we are made of this stuff of exploded stars. We are made of star dust. And so therefore, we are at least one of the ways that the universe knows itself." Sounds familiar? Yes, because the astrophysicist Neil deGrasse Tyson has been saying the same thing. That is if you are familiar with Tyson's work. A couple of years ago, Tyson was asked by a reader of the Time magazine the question, "What is the most astounding fact that you can share with us about the universe?" Tyson's answer? Listen to it below. It's fascinating.